Management needs a deep understanding of strategy, controlling, finances and HR in order to perform effectively. The core competencies of the Faculty of Business Administration and Engineering are marketing, sales, communication and R&D. You will gain an understanding of the complete product lifecycle. The first machine is sold by "Sales", all the others by "Service". This mechanical engineering principle can be applied to many business sectors. But success in the marketplace actually requires much more: sales, marketing and service must be combined to make one complete package. International teamwork will become a matter of course through working together with students of many different nationalities and an integrated international workshop. The management of information is of primary importance for businesses and business processes. As an MBA programme, we are committed to the support of talent. That's why every semester we award an MBA scholarship of over €3000 to a deserving candidate. Each scholarship holder will have half of the tuition fees paid for the duration of 3 semesters. Criteria for the award of the scholarship include outstanding performance during undergraduate studies and in the working life, deep knowledge of subject area and international experience. The exact criteria can be found in the Tuition Fee Regulations for the study programme (§ 6 Gebührenerlass), below. The scholarship will be awarded after all applications have been submitted. If you are interested in applying for a scholarship, please submit a separate letter of application with your application for a study place including proof of achievements. 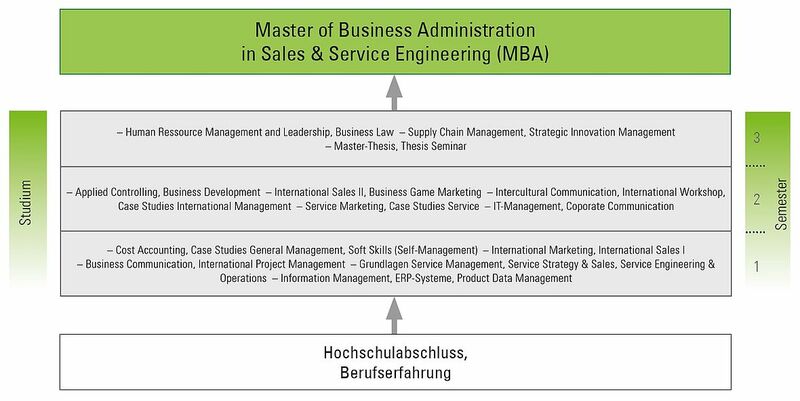 Unlike most master's programmes, the Sales & Service MBA can also be started in the summer semester and the programme takes 4 semesters instead of 3. Starting lectures in the second semester, you can take 50% of these courses right away. These are: Corporate Communication, Business Development, Intercultural Communication, Service Marketing and International Sales II. In the following semester you take the regular courses of the first semester. In the third semester you complete the missing lectures from the second semester: Applied Controlling, Business Game Marketing, IT Management, Case Studies Service, Case Studies International Management and International Workshop. In the final semester you take the normal courses from the third semester. By taking the MBA degree over 4 semesters you have more time to complete the course. This can be particularly helpful if you are under time pressure at work. Please note: additional tuition fees are payable for the extra semester.